Over half of Iran is desert and there is an ancient tradition of making gardens which provide relief from the extremes of the climate – summer heat and winter cold. The ancient Persians, who were of nomadic origin, made encampment gardens of a character very different to those of the Roman empire. The best and oldest example is at Pasargadae. It dates from 550 BC and was made in an oasis ringed by hills. Cyrus built pavilions, presumably amongst trees, and enclosed the garden within a mud wall. There was a rectangular network of canals within the compound. Basins from which water could be drawn were made at the intersection points. 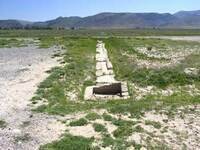 The channels were lined with stone and survive as an unmistakable ancestor of later Islamic gardens. Since garden walls were built of mud brick, which needs uninterrupted maintenance, few survive. The word ‘paradise’, from the old Persian, Pardeiza, meaning a ‘a wall around’ describes an enclosed space. In origin it was probably a walled or fenced hunting park, used to make collections of exotic plants, animals and trees. 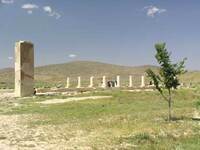 Pasargadae was the first capital of the Achaemenid Empire. To garden historians it is of particular interest because of the rectangular pattern of stone-lined watercourses. This type of garden became known as a chahar bagh at a later date but there is no evidence of the word being used in Achaemenid times. After its occupation by the Arabs in the seventh century Iran came under the influence of the Islamic architectural and garden ideas. The Koran has many references to the four rivers of Paradise and to gardens as a symbol of Paradise. Fused with the older tradition of using rectangular networks of irrigation canals to make gardens, these ideas led to the classical Islamic gardens. The garden walls were made of mud brick and no physical examples of palace gardens survive from the period 700 to 1500 AD. Islam also led to the making of [[mosque]] courts and [[madrassah]] courts which also had the form of rectangular courts with pools. The oldest written descriptions and illustrations of Iranian gardens come from travelers who reached Iran from lands to the west. These accounts include Ibn Battuta in the fourteenth century, Ruy Gonzalez de Clavijo in the fifteenth century and Engelbert Kaempfer in the seventeeth century. Kaempfer made careful drawings and converted them into detailed engravings after his return to Europe. They show chahar bagh type gardens with the following features: an enclosing wall, rectangular pools, an internal network of canals, garden pavilions and lush planting. There are surviving examples of this garden type at Yazd (Dowlatabad ) and at Kashan (Bagh-e Fin).